Calendar of Treasury Books and Papers, Volume 1, 1729-1730. Originally published by Her Majesty's Stationery Office, London, 1897. 55. Memorial of Brigadier-General G/954/orge Preston to the Lords of the Treasury. In 1715 he received from the Duke of Argyle 200l. to enable him to provision the garrison of Edinburgh Castle at the time of the rebellion. He is now returned in super by the Auditors of the Imprests in the Earl of Lincoln's account for 1719. In 1717, 1718, and 1719 he received from the Receivers General in North Britain 1,984l. 3s. 10½d. for which he gave bills on the Earl of Lincoln, then Paymaster General of the Forces. Of this his Lordship has 200l. in his account for 1717, for which memorialist is also set in super. Memorialist has disbursed same for His Majesty's service as by account annexed. He commanded the forces in North Britain for nine years, and had only an allowance of 260l. which was his proportion of what was allowed for the general officers for 1719. Prays the King's warrant for taking off the said 400l. and for allowing the Earl of Lincoln the remaining 1784l. 3s. 10½d. in his final account. 1 page. Appending:—Statement of account. 2 pages. 57. Release granted to Edmund David of messuages and lands in the parish of Llanvair at a reserve rent of 5s. and fine of 100s. 58. Warrant from the Lords of the Treasury to the Clerk of the Pipe for the preparation of a lease to pass the Exchequer Seal of seven messuages on the east side of St. James's Street, to Thomas Clough for 38 years, to commence from Michaelmas 1740, at a reserve rent of 19l. 10s. and a fine of 320l. Appending:—Copy of original lease and memorandum and particular of same by Thomas Jett, Auditor, and Phillips Gybbon, Surveyor General, dated 1728–9, January 11 and 31. 59. 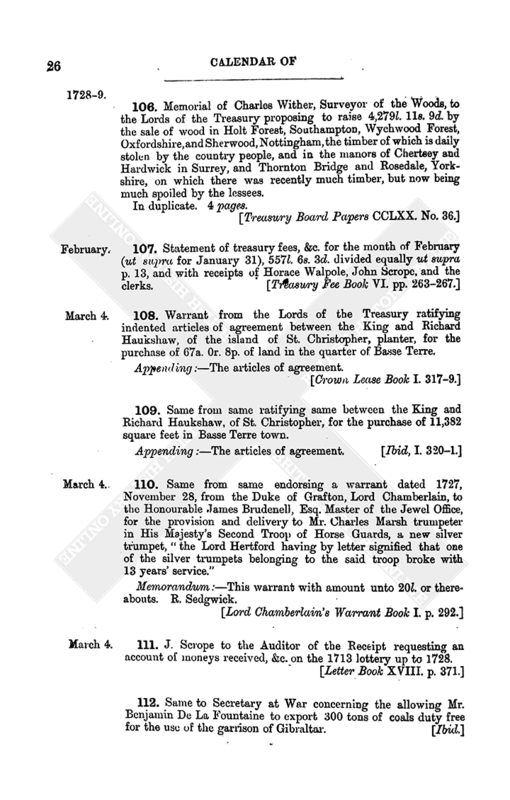 Warrant from the Lords of the Treasury ratifying indented articles of agreement between the King and Charles Pym, John Willet, Drewry Ottley, executors of Richard Holmes, Esq. for the purchase of 200 acres in Basse Terre Town, St. Christopher. 60. Order for the issue of 3,000l. to the Privy Purse for the monthly allowance. Order for the issue of 1,000l. to the Treasurer of the Chamber for advance to the Messengers on foreign voyages according to the desire of the Duke of Newcastle's letter of 29th ultimo. Order for the issue of 375l. to the Duke of Leeds pursuant to his warrants in that behalf. Mr. Lowther is to pay Elizabeth Andrews 20l. as His Majesty's bounty. 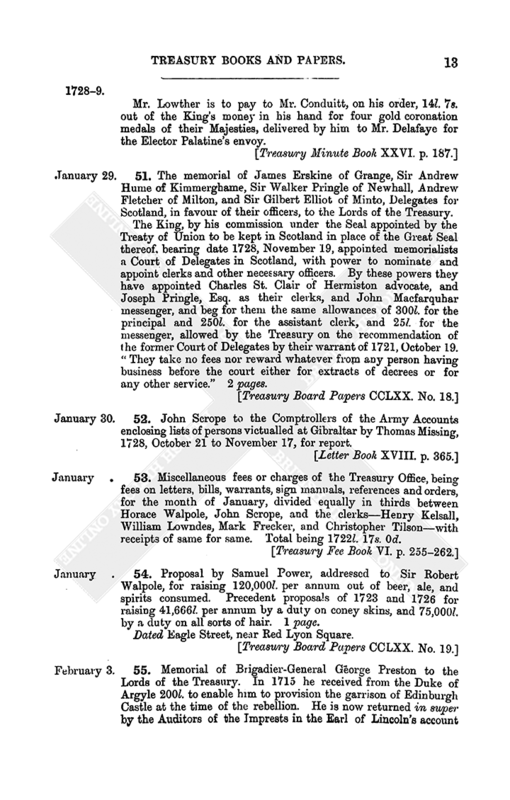 Order for the preparation of a report to the Council on the order some time since made relating to the price of coin in Jersey. 62. 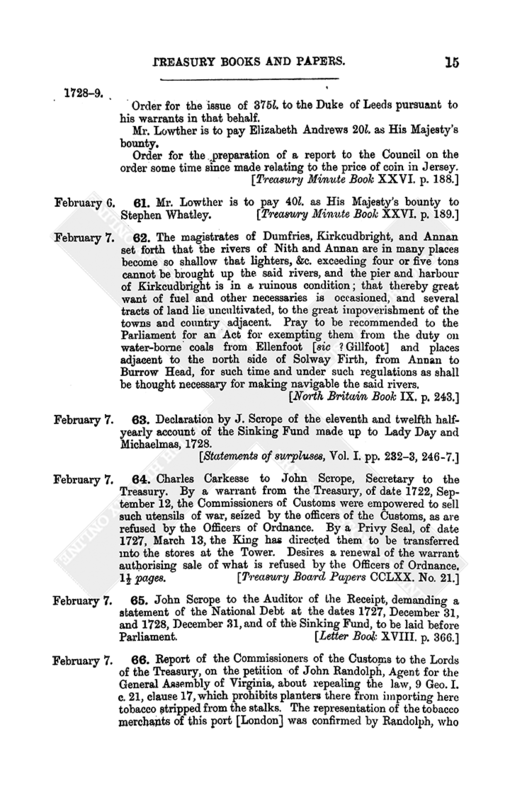 The magistrates of Dumfries, Kirkcudbright, and Annan set forth that the rivers of Nith and Annan are in many places become so shallow that lighters, &c. exceeding four or five tons cannot be brought up the said rivers, and the pier and harbour of Kirkcudbright is in a ruinous condition; that thereby great want of fuel and other necessaries is occasioned, and several tracts of land lie uncultivated, to the great impoverishment of the towns and country adjacent. Pray to be recommended to the Parliament for an Act for exempting them from the duty on water-borne coals from Ellenfoot [sic? Gillfoot] and places adjacent to the north side of Solway Firth, from Annan to Burrow Head, for such time and under such regulations as shall be thought necessary for making navigable the said rivers. 63. Declaration by J. Scrope of the eleventh and twelfth half-yearly account of the Sinking Fund made up to Lady Day and Michaelmas, 1728. 66. Report of the Commissioners of the Customs to the Lords of the Treasury, on the petition of John Randolph, Agent for the General Assembly of Virginia, about repealing the law, 9 Geo. I. c. 21, clause 17, which prohibits planters there from importing here tobacco stripped from the stalks. The representation of the tobacco merchants of this port [London] was confirmed by Randolph, who has resided several years in Virginia, viz. that the leaves of the tobacco plant which grow next the ground are so spotted and injured by rain and dirt that they are unfit for any market in the entire leaf; but while the planters were at liberty to take out the stalk, they separated the good from the bad, and packed only that fit for sale promiscuously in the hogshead; but they are now obliged to throw them away, or dispose of them to the sailors at very low prices. Are of opinion that the repeal of the clause would be a benefit to the planters. 2 pages. Appending:—Randolph's memorial to the Treasury. 1 page. 67. 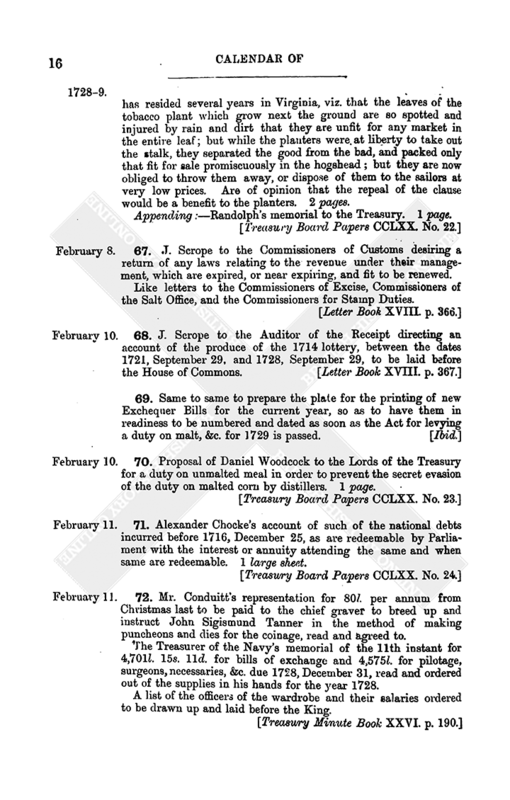 J. Scrope to the Commissioners of Customs desiring a return of any laws relating to the revenue under their management, which are expired, or near expiring, and fit to be renewed. Like letters to the Commissioners of Excise, Commissioners of the Salt Office, and the Commissioners for Stamp Duties. 70. Proposal of Daniel Woodcock to the Lords of the Treasury for a duty on unmalted meal in order to prevent the secret evasion of the duty on malted corn by distillers. 1 page. 71. Alexander Chocke's account of such of the national debts incurred before 1716, December 25, as are redeemable by Parliament with the interest or annuity attending the same and when same are redeemable. 1 large sheet. 72. Mr. Conduitt's representation for 80l. per annum from Christmas last to be paid to the chief graver to breed up and instruct John Sigismund Tanner in the method of making puncheons and dies for the coinage, read and agreed to. The Treasurer of the Navy's memorial of the 11th instant for 4,701l. 15s. 11d. for bills of exchange and 4,575l. for pilotage, surgeons, necessaries, &c. due 1728, December 31, read and ordered out of the supplies in his hands for the year 1728. A list of the officers of the wardrobe and their salaries ordered to be drawn up and laid before the King. 73. 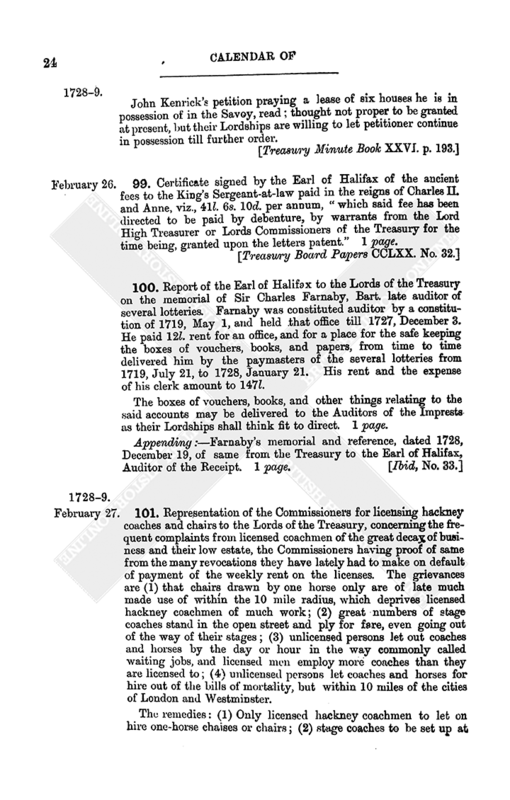 Warrant from the Lords of the Treasury to the Auditor of the Receipt authorising the issue of deputations to the Collector inwards of London port and to Mr. Hinton, deputy to the Register of the Seizures, to receive the King's share of forfeitures, paying the money into the receipt of the Exchequer from time to time. Appending:—The memorial of the Commissioners for Customs to the Lords of the Treasury with regard to the law of 12 Geo. 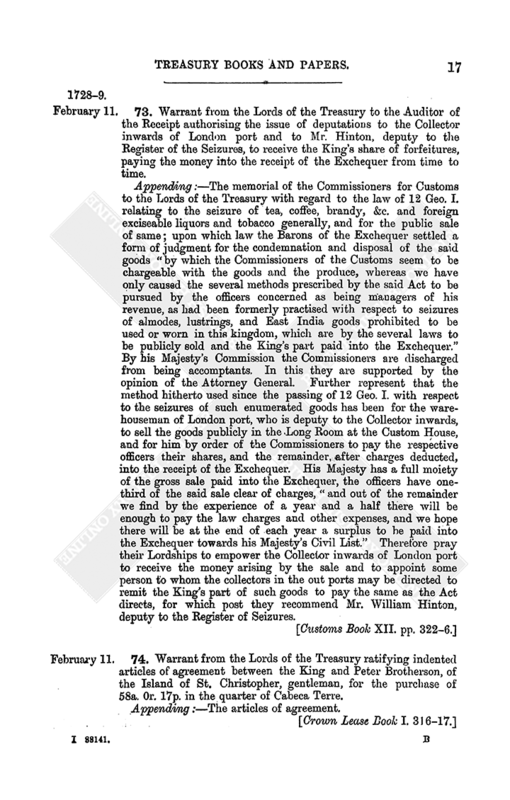 I. relating to the seizure of tea, coffee, brandy, &c. and foreign exciseable liquors and tobacco generally, and for the public sale of same; upon which law the Barons of the Exchequer settled a form of judgment for the condemnation and disposal of the said goods “by which the Commissioners of the Customs seem to be chargeable with the goods and the produce, whereas we have only caused the several methods prescribed by the said Act to be pursued by the officers concerned as being managers of his revenue, as had been formerly practised with respect to seizures of almodes, lustrings, and East India goods prohibited to be used or worn in this kingdom, which are by the several laws to be publicly sold and the King's part paid into the Exchequer.” By his Majesty's Commission the Commissioners are discharged from being accomptants. In this they are supported by the opinion of the Attorney General. Further represent that the method hitherto used since the passing of 12 Geo. I. with respect to the seizures of such enumerated goods has been for the warehouseman of London port, who is deputy to the Collector inwards, to sell the goods publicly in the Long Room at the Custom House, and for him by order of the Commissioners to pay the respective officers their shares, and the remainder, after charges deducted, into the receipt of the Exchequer. His Majesty has a full moiety of the gross sale paid into the Exchequer, the officers have one-third of the said sale clear of charges, “and out of the remainder we find by the experience of a year and a half there will be enough to pay the law charges and other expenses, and we hope there will be at the end of each year a surplus to be paid into the Exchequer towards his Majesty's Civil List.” Therefore pray their Lordships to empower the Collector inwards of London port to receive the money arising by the sale and to appoint some person to whom the collectors in the out ports may be directed to remit the King's part of such goods to pay the same as the Act directs, for which post they recommend Mr. William Hinton, deputy to the Register of Seizures. 74. Warrant from the Lords of the Treasury ratifying indented articles of agreement between the King and Peter Brotherson, of the Island of St. Christopher, gentleman, for the purchase of 58a. 0r. 17p. in the quarter of Cabeca Terre. 75. Order from the Lords of the Treasury, endorsing a warrant, dated 1727–8, March 13, from the Duke of Grafton to James Brudenell, Master of the Jewel House, for the provision and delivery to Lord William Beauclerc of 13 ozs. of gilt plate as a gift from the King at the christening of his child. Memorandum:—This warrant will amount to 75l. R. Sedgwick. 76. Warrant from the Lords of the Treasury to the Clerk of the Pipe for passing a lease under the Exchequer Seal to Henry Strong of two messuages in Castle Street and two messuages in Ayr Street, in the parish of St. James's, for 44½ years, to date from Lady Day 1734, at a reserved rent of 5li. 7s. 0d. and 12 pence for each messuage and fine of 120li. Appending:—Copy of original lease and memorandum and particular of same by Auditor Thos. Jett and Phillips Gybbon, Surveyor General, dated 1728–9, January 11 and February 5. 77. J. Scrope to the Auditor of the Receipt for a statement of account of the national debts incurred before 1726, December 25, redeemable with interest, to be laid before the House of Commons. 78. John Scrope to Charles Wither directing a view of the pheasantry in Bushey Park within His Majesty's houses and manor of Hampton Court, and to estimate for the repairs necessary there, and to advise as to how the charge may best be defrayed. 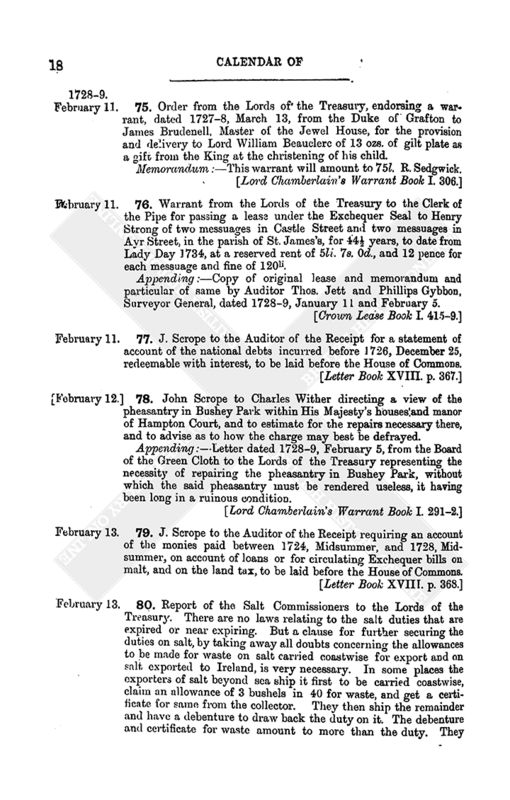 Appending:—Letter dated 1728–9, February 5, from the Board of the Green Cloth to the Lords of the Treasury representing the necessity of repairing the pheasantry in Bushey Park, without which the said pheasantry must be rendered useless, it having been long in a ruinous condition. 79. J. Scrope to the Auditor of the Receipt requiring an account of the monies paid between 1724, Midsummer, and 1728, Midsummer, on account of loans or for circulating Exchequer bills on malt, and on the land tax, to be laid before the House of Commons. 80. Report of the Salt Commissioners to the Lords of the Treasury. There are no laws relating to the salt duties that are expired or near expiring. But a clause for further securing the duties on salt, by taking away all doubts concerning the allowances to be made for waste on salt carried coastwise for export and on salt exported to Ireland, is very necessary. In some places the exporters of salt beyond sea ship it first to be carried coastwise, claim an allowance of 3 bushels in 40 for waste, and get a certificate for same from the collector. They then ship the remainder and have a debenture to draw back the duty on it. The debenture and certificate for waste amount to more than the duty. They also demand 4 bushels in 40 for waste on salt exported to Ireland. The actual waste is not 1 bushel in 40. 2 pages. Appending:—Draft clause for remedying above. 3 pages. 82. Petition to King George II. from Marguerite Jolis, 58 years old; De Rayneval, 54 years old; Grosmenil, 75 years old; De Refuge, 68 years old and blind; Du Fraine, 56 years old, and Annie Le Bas, 65 years old. Are members of a society founded at the Hague in 1686 by Queen Mary by a grant of 200l. pension, which was continued till the death of George I. Pray a continuation of the bounty. The Hague. 2 pages. French. 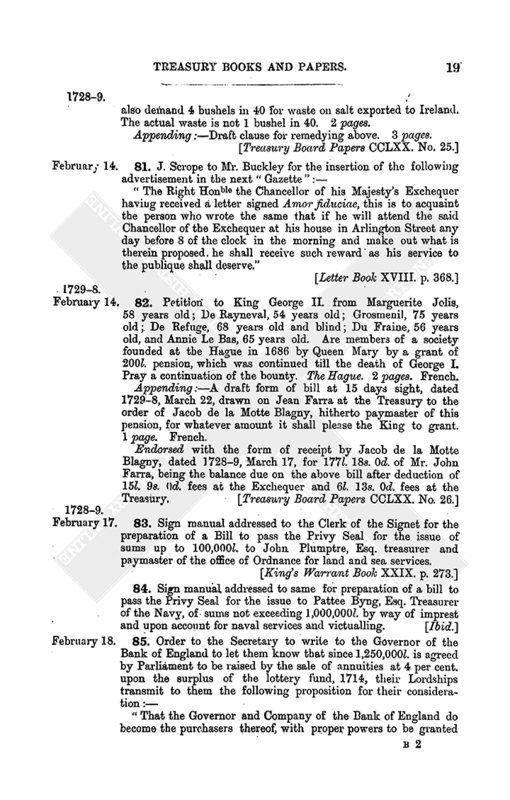 Appending:—A draft form of bill at 15 days sight, dated 1729–8, March 22, drawn on Jean Farra at the Treasury to the order of Jacob de la Motte Blagny, hitherto paymaster of this pension, for whatever amount it shall please the King to grant. 1 page. French. 83. Sign manual addressed to the Clerk of the Signet for the preparation of a Bill to pass the Privy Seal for the issue of sums up to 100,000l. to John Plumptre, Esq. treasurer and paymaster of the office of Ordnance for land and sea services. “That the Governor and Company of the Bank of England do become the purchasers thereof, with proper powers to be granted to them to sell and assign the same from time to time as they shall think proper. The tradesmen of the wardrobe ordered to attend on Thursday next. The business of the exchange of estates between the trustees and the family of the Hampdens to be considered on Thursday next. 86. Report of the Barons of the Exchequer in Scotland to the Lords of the Treasury on the memorial of John Earl of Breadalbane to the same. The Earl is liable to the Crown for 19l. 0s. 2d. per annum for Feu and Blench duties for the lordship of Disheor and Foyer, lands of Ardtalnaig (“Ardtollany”) and others in the county of Perth. These have been sometimes remitted by the Crown. In 1713, Queen Anne remitted 13 years arrears of them. They are now 10 years in arrear. It appears by the declaration of 1716, May 2, of Colonel Alexander Campbell, of Fanal, captain of an independent company, that he was sent for by the Earl's lady in December 1715, to occupy his house of Finlarig, in Perth, in order to hinder the men of Breadalbane from joining the rebels as she was informed they designed. This he did with his independent company and 400 militia, and thereby broke the designs of the rebels on the Breadalbane men. The said Earl also sustained a considerable loss by this garrisoning of his house by His Majesty's forces. Dated Edinburgh Exchequer Chamber. 1½ pages. 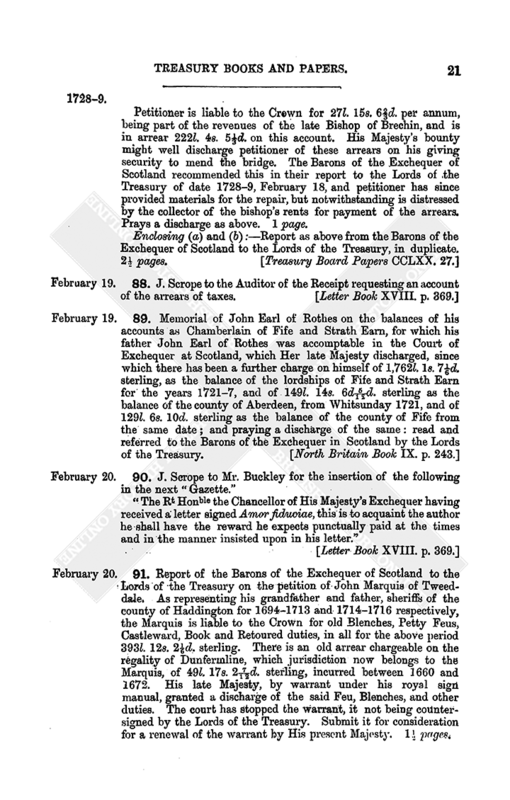 Appending:—The petition of the Earl of Breadalbane, with reference of same, dated 1728–9, January 1, from the Treasury to the Barons of the Exchequer in Scotland. 1 page.br/>Minuted:—1729–30, January 7. Read and ordered. 87. Memorial on the behalf of John Scott, of Ancrum, Esq. The keeping up a stone bridge over Ale Water near the parish church of Ancrum, Roxburghshire, is necessary for the communications of the eastern and western parts of the shire and of Dumfries with Berwick, in case of any flood of waters. The present old bridge of four stone arches and three large pillars is so ruinous that it will require 199l. 10s. to repair. By the law of Scotland this is chargeable on the county, but is too large a sum to be raised at once by reason of the smallness of the sum the county is empowered to raise at a time for such uses. Petitioner is liable to the Crown for 27l. 15s. 62/3d. 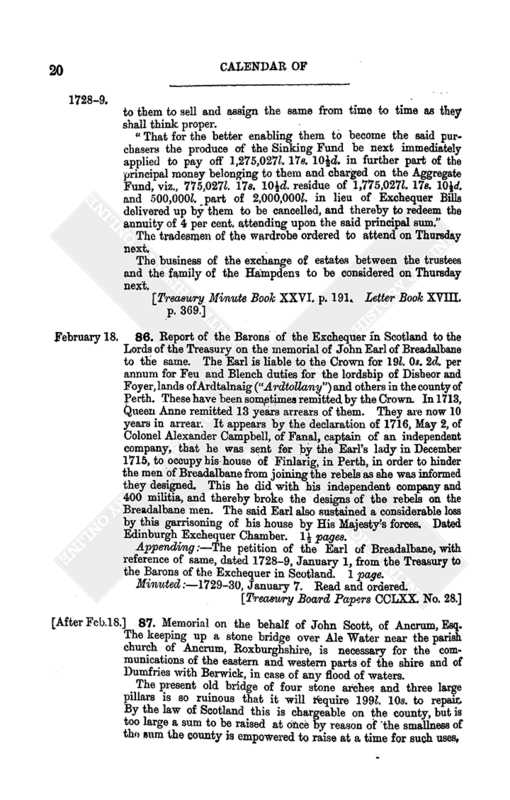 per annum, being part of the revenues of the late Bishop of Brechin, and is in arrear 222l. 4s. 5⅓d. on this account. His Majesty's bounty might well discharge petitioner of these arrears on his giving security to mend the bridge. 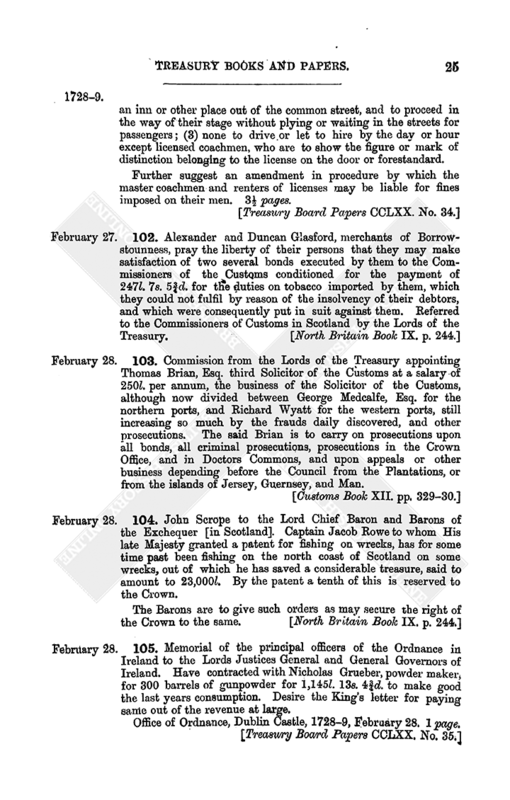 The Barons of the Exchequer of Scotland recommended this in their report to the Lords of,the Treasury of date 1728–9, February 18, and petitioner has since provided materials for the repair, but notwithstanding is distressed by the collector of the bishop's rents for payment of the arrears. Prays a discharge as above. 1 page. 91. Report of the Barons of the Exchequer of Scotland to the Lords of the Treasury on the petition of John Marquis of Tweeddale. As representing his grandfather and father, sheriffs of the county of Haddington for 1694–1713 and 1714–1716 respectively, the Marquis is liable to the Crown for old Blenches, Petty Feus, Castleward, Book and Retoured duties, in all for the above period 393l. 12s. 21/6d. sterling. There is an old arrear chargeable on the regality of Dunfermline, which jurisdiction now belongs to the Marquis, of 49l. 17s. 27/12d. sterling, incurred between 1660 and 1672. His late Majesty, by warrant under his royal sign manual, granted a discharge of the said Feu, Blenches, and other duties. The court has stopped the warrant, it not being countersigned by the Lords of the Treasury. Submit it for consideration for a renewal of the warrant by His present Majesty. 1½pages. Enclosing:—Petition Of the Marquis of Tweeddale to the Lords of the Treasury, and reference dated 1727–8, March 13, from them to the Barons of the Exchequer in Scotland. 2½pages. 92. Report of the Barons of the Exchequer in Scotland to the Lords of the Treasury, on the petition of Anne, widow of Dr. Alexander Mackenzie, late collector of the rents of the Bishop of Ross. King William III. granted to Bernard Mackenzie, father of the deceased doctor, a pension of 100l. per annum for services performed. 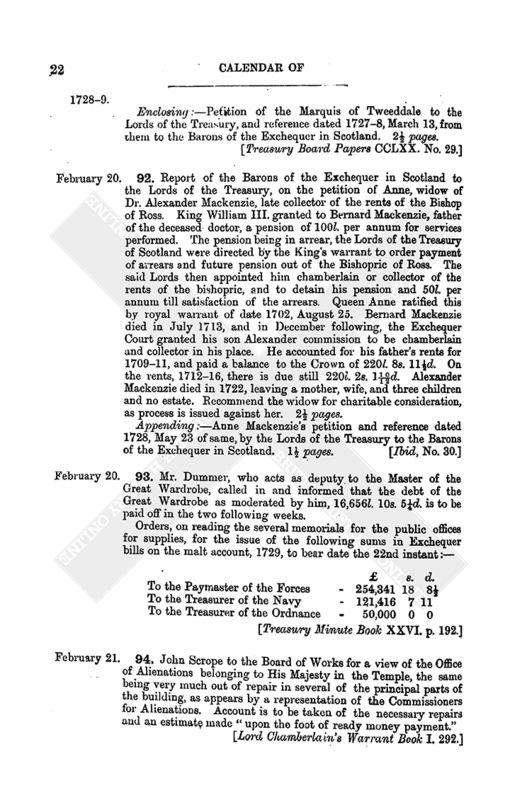 The pension being in arrear, the Lords of the Treasury of Scotland were directed by the King's warrant to order payment of arrears and future pension out of the Bishopric of Ross. The said Lords then appointed him chamberlain or collector of the rents of the bishopric, and to detain his pension and 50l. per annum till satisfaction of the arrears. Queen Anne ratified this by royal warrant of date 1702, August 25. Bernard Mackenzie died in July 1713, and in December following, the Exchequer Court granted his son Alexander commission to be chamberlain and collector in his place. He accounted for his father's rents for 1709–11, and paid a balance to the Crown of 220l. 8s. 11½d. On the rents, 1712–16, there is due still 220l. 2s. 110/12d. Alexander Mackenzie died in 1722, leaving a mother, wife, and three children and no estate. Recommend the widow for charitable consideration, as process is issued against her. 2½pages. 93. Mr. Dummer, who acts as deputy to the Master of the Great Wardrobe, called in and informed that the debt of the Great Wardrobe as moderated by him, 16,656l. 10s. 5¼d. is to he paid off in the two following weeks. 95. William Bowles, solicitor to the Exchequer Court in Scotland, to —. 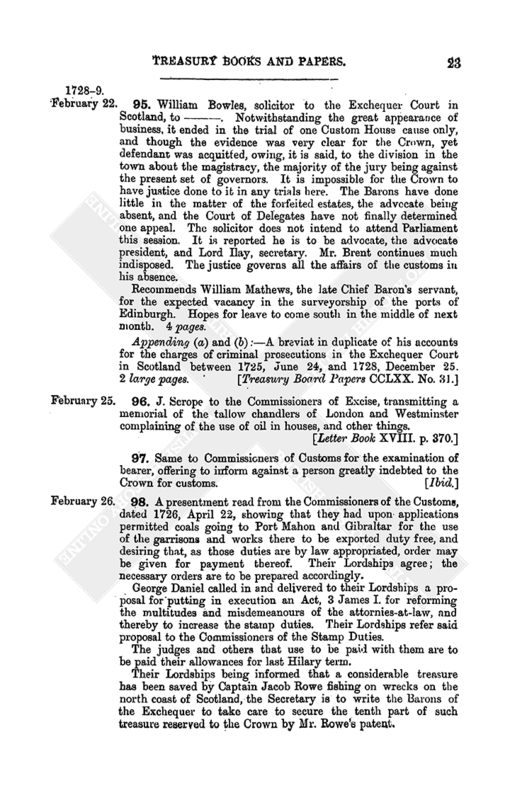 Notwithstanding the great appearance of business, it ended in the trial of one Custom House cause only, and though the evidence was very clear for the Crown, yet defendant was acquitted, owing, it is said, to the division in the town about the magistracy, the majority of the jury being against the present set of governors. It is impossible for the Crown to have justice done to it in any trials here. The Barons have done little in the matter of the forfeited estates, the advocate being absent, and the Court of Delegates have not finally determined one appeal. The solicitor does not intend to attend Parliament this session. It is reported he is to be advocate, the advocate president, and Lord Ilay, secretary. Mr. Brent continues much indisposed. The justice governs all the affairs of the customs in his absence. Recommends William Mathews, the late Chief Baron's servant, for the expected vacancy in the surveyorship of the ports of Edinburgh. Hopes for leave to come south in the middle of next month. 4 pages. 96. J. Scrope to the Commissioners of Excise, transmitting a memorial of the tallow chandlers of London and Westminster complaining of the use of oil in houses, and other things. 98. A presentment read from the Commissioners of the Customs, dated 1726, April 22, showing that they had upon applications permitted coals going to Port Mahon and Gibraltar for the use of the garrisons and works there to be exported duty free, and desiring that, as those duties are by law appropriated, order may be given for payment thereof. Their Lordships agree; the necessary orders are to be prepared accordingly. George Daniel called in and delivered to their Lordships a proposal for putting in execution an Act, 3 James I. for reforming the multitudes and misdemeanours of the attornies-at-law, and thereby to increase the stamp duties. Their Lordships refer said proposal to the Commissioners of the Stamp Duties. The judges and others that use to be paid with them are to be paid their allowances for last Hilary term. Their Lordships being informed that a considerable treasure has been saved by Captain Jacob Rowe fishing on wrecks on the north coast of Scotland, the Secretary is to write the Barons of the Exchequer to take care to secure the tenth part of such treasure reserved to the Crown by Mr. Rowe's patent. John Kenrick's petition praying a lease of six houses he is in possession of in the Savoy, read; thought not proper to be granted at present, but their Lordships are willing to let petitioner continue in possession till further order. 99. Certificate signed by the Earl of Halifax of the ancient fees to the King's Sergeant-at-law paid in the reigns of Charles II. and Anne, viz., 41l. 6s. 10d. per annum, “which said fee has been directed to be paid by debenture, by warrants from the Lord High Treasurer or Lords Commissioners of the Treasury for the time being, granted upon the letters patent.” 1 page. 100. 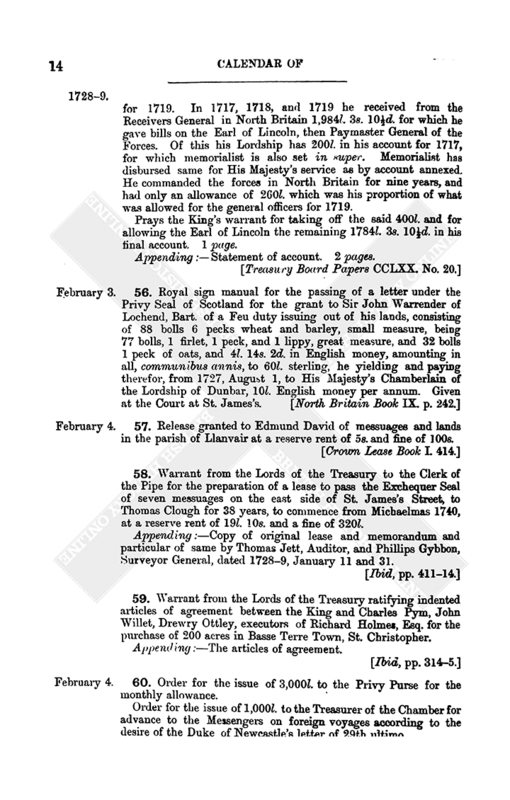 Report of the Earl of Halifax to the Lords of the Treasury on the memorial of Sir Charles Farnaby, Bart. late auditor of several lotteries. Farnaby was constituted auditor by a constitution of 1719, May 1, and held.that office till 1727, December 3. He paid 12l. rent for an office, and for a place for the safe keeping the boxes of vouchers, books, and papers, from time to time delivered him by the paymasters of the several lotteries from 1719, July 21, to 1728, January 21. His rent and the expense of his clerk amount to 147l. The boxes of vouchers, books, and other things relating to the said accounts may be delivered to the Auditors of the Imprests as their Lordships shall think fit to direct. 1 page. 101. Representation of the Commissioners for licensing hackney coaches and chairs to the Lords of the Treasury, concerning the frequent complaints from licensed coachmen of the great decay of business and their low estate, the Commissioners having proof of same from the many revocations they have lately had to make on default of payment of the weekly rent on the licenses. The grievances are (1) that chairs drawn by one horse only are of late much made use of within the 10 mile radius, which deprives licensed hackney coachmen of much work; (2) great numbers of stage coaches stand in the open street and ply for fare, even going out of the way of their stages; (3) unlicensed persons let out coaches and horses by the day or hour in the way commonly called waiting jobs, and licensed men employ more coaches than they are licensed to; (4) unlicensed persons let coaches and horses for hire out of the bills of mortality, but within 10 miles of the cities of London and Westminster. an inn or other place out of the common street, and to proceed in the way of their stage without plying or waiting in the streets for passengers; (3) none to drive or let to hire by the day or hour except licensed coachmen, who are to show the figure or mark of distinction belonging to the license on the door or forestandard. Further suggest an amendment in procedure by which the master coachmen and renters of licenses may be liable for fines imposed on their men. 3½ pages. 103. Commission from the Lords of the Treasury appointing Thomas Brian, Esq. third Solicitor of the Customs at a salary of 250l. per annum, the business of the Solicitor of the Customs, although now divided between George Medcalfe, Esq. for the northern ports, and Richard Wyatt for the western ports, still increasing so much by the frauds daily discovered, and other prosecutions. The said Brian is to carry on prosecutions upon all bonds, all criminal prosecutions, prosecutions in the Crown Office, and in Doctors Commons, and upon appeals or other business depending before the Council from the Plantations, or from the islands of Jersey, Guernsey, and Man. 104. John Scrope to the Lord Chief Baron and Barons of the Exchequer [in Scotland]. Captain Jacob Rowe to whom His late Majesty granted a patent for fishing on wrecks, has for some time past been fishing on the north coast of Scotland on some wrecks, out of which he has saved a considerable treasure, said to amount to 23,000l. By the patent a tenth of this is reserved to the Crown. 105. Memorial of the principal officers of the Ordnance in Ireland to the Lords Justices General and General Governors of Ireland. Have contracted with Nicholas Grueber, powder maker, for 300 barrels of gunpowder for 1,145l. 13s. 4¾d. to make good the last years consumption. Desire the Bang's letter for paying same out of the revenue at large. Office of Ordnance, Dublin Castle, 1728–9, February 28. 1 page. 106. Memorial of Charles Wither, Surveyor of the Woods, to the Lords of the Treasury proposing to raise 4,279l. 11s. 9d. by the sale of wood in Holt Forest, Southampton, Wychwood Forest, Oxfordshire, and Sherwood, Nottingham, the timber of which is daily stolen by the country people, and in the manors of Chertsey and Hardwick in Surrey, and Thornton Bridge and Rosedale, Yorkshire, on which there was recently much timber, but now being much spoiled by the lessees.